Happy Friday the 13th, February 2015! The number ’13’ is often referred to as the number of transition/change. It is seen as constantly being at odds with the ’12’, trying to undo the completeness of that even number. People in general are resistant to change and reluctant to take on change when times are going well. But change in inevitable and constantly moves us forward, often whither we want it to or not. 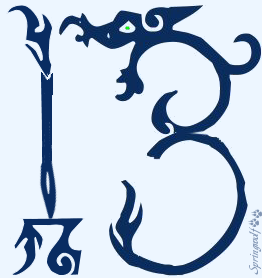 For Pagans, 13 is the perfect number. It represents good luck and moving with the flow of Divine energy. Going with the flow is an important part of Pagan perspectives. Fighting against the tide is akin to fighting against change making bad situations even worse than they already are. Where as going with the flow of change brings peace and harmony. Even if you’re flowing with the tide, you are always in control of the paddle of your ship. Guide it safely forward and you’ll reap the benefits of the opportunities that cross your path. There are a couple of articles here on Reflections that cover Friday the 13th. for those of you interested in learning more. Friday the 13th and the Full Moon – What’s In A Day? We hope you enjoy the first Friday the 13th for 2015. Make it a good one and it will be good to you in return.